In the heart of the best Bass, Bream, Crappie fishing and Duck Hunting on Lake Seminole. 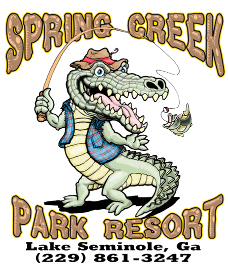 Motel, Lodges, Cabins, Full Service RV sites, primitave camping, covered boat dock with large, multi-ramp landing adjacent. Plus two terrific restaurants and a country store. Located off of Hwy 253 at Reynoldsville, 16.3 miles south of Donalsonville, GA. and 15 miles southwest of Bainbridge, GA. Come for the weekend or for a whole week. Bring the family...or not. Take some time to enjoy all the fun that is Lake Seminole. Reunions, Banquets, Concerts even Weddings.